Video marketing is about more than just following best practices — it’s also about avoiding some of the most significant mistakes. History is littered with marketing blunders, especially when it comes to content that’s as sensitive and complex as video. If you want to make sure that you don’t alienate or insult your audience, you need to make sure you aren’t repeating the mistakes of the past. 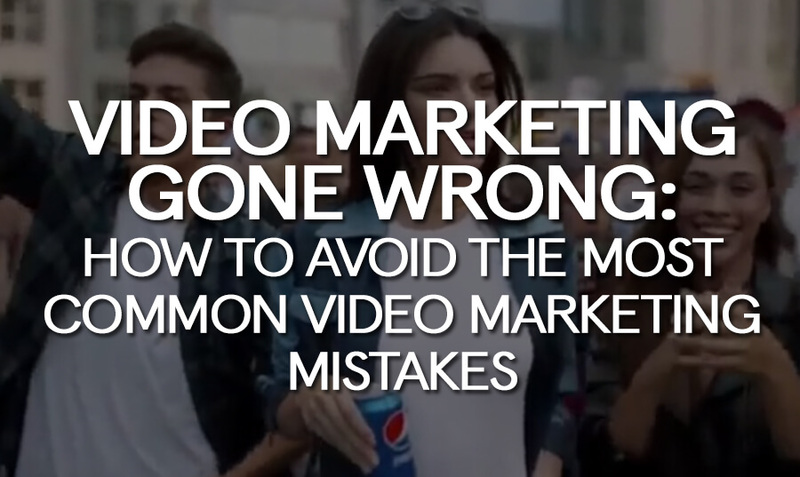 Here are some of the most common video marketing mistakes. Throwing money at a video doesn’t necessarily make it good. Every year, America finds at least some of its high cost Superbowl ads lacking. Consider the 2018 Dodge Ram ad that tried to use a Martin Luther King Jr speech to sell trucks, or the way that Squarespace shot its advertising budget on an inscrutable Keanu Reeves production. These high budget ads left audiences scratching their head, rather than more interested about their product. Comparatively, take a look at this low budget animal shelter ad that almost immediately went viral. Though it didn’t have a budget, it understood its audience and trusted its audience to be on board with its message. At its core, video marketing is about relating to your audience. If you don’t have the right message — and you don’t trust your audience — millions of dollars isn’t going to save you. A creative, intelligent young girl races through her day on her tablet, using it to do everything from design new fashion to keep in touch with her friends. At the end of the seemingly unobjectionable commercial, her neighbor asks politely: What are you doing on that computer? “What’s a computer?” the child asks — and immediately enrages 90% of the audience. It made the child seem either sarcastic or dumb. Any child that age knows exactly what a computer does — so, though the rest of the commercial displayed an inquisitive, insightful young girl, the end of the commercial turned her into a brat. It’s strange that Apple’s focus testing didn’t reveal these problems, but you can avoid these problems by testing your commercials and videos with your demographic. Always consider how your demographic is going to view a video. Which characters are they going to associate with on the screen? In Apple’s commercial, they wanted millennials to associate with the child — but that obviously didn’t happen. Instead, millennials associated with the neighbor — the neighbor who asked politely, “What are you doing on your computer?” and was lambasted for being an old fogey. Low budget doesn’t have to mean low quality. Today, most people have 4K cameras in their pockets: their smartphones. It’s not overly expensive to rent or purchase the right equipment for your video production. Today’s consumers have high-definition monitors and televisions. They can see everything: including the low quality of your ad. If you’re putting your ads up online — and just viewing them on a mobile phone screen — you may not be able to see how blurry and indistinct they actually are. You may also not see that there are things that are hidden in the background, if you aren’t looking close enough. Low quality ads immediately make consumers think that your product is also low quality, as you can’t put the time and effort into your ad to make sure it’s acceptable. There’s a term on the Internet for companies that try to be too cool: it’s called “fellow kids.” It’s named after a character in the television show 30 Rock who tries to fit in with “youth culture” — with awkward, embarrassing results. Culture evolves, and often in very nuanced ways. Companies delving into Internet culture, teen culture, or millennial culture need to be very aware of what they’re doing — they need consultants who are actually a part of the demographic that they’re trying to reach. Otherwise, it becomes an embarrassing misstep. Consider the San Antonio-based mattress company which posted a video for its mattress sale… featuring the Twin Towers. They were trying to be edgy for their audience, but failed abysmally: some things that are joked about in private aren’t meant to be public. Likewise, Pepsi was nearly boycotted after it attempted to publish an advertisement featuring star Kendall Jenner, at a protest against police brutality. Pepsi was coming from its understanding of prior generations, in which the goal was ultimately to promote peace between the protestors (hippies) and the police force (surrogates for the military). They didn’t understand that the new protests were specifically against violence caused by the police, and that their advertisement would appear to be promoting this violence, rather than discouraging it. They had all the components in place, but couldn’t understand it. In general, it’s better to avoid hot button topics at all. In 2016, a Chinese detergent company found itself in hot water… after its advertisement showed a black man getting washed into an Asian man. The implications were obvious: black was dirty, light was clean, and you should always prefer light. From the company’s perspective, China simply wasn’t as embroiled within racial hostility as the United States: they saw it as a whimsical advertisement, rather than a racially insensitive one. With 91.59% of the population in China being Chinese, racial considerations are rare because encountering other races is rare. Marketing is now global. Expect that your video marketing is going to be viewed by anywhere in the world, and approach it with compassion. There are many socially engrained biases that people have that they may not see unless they are shown it by another person. Similarly, you need to understand that other demographics are also going to view your videos. When Bud Light launched its new #UpForWhatever campaign, its commercials were filled with its tagline: “The perfect beer for removing ‘no’ from your vocabulary for the night.” A great tagline for the demographic they were shooting for — male adrenaline junkies and partiers — but not a great tagline for, it turns out, most women. There are many weird commercials out there that leave the audience saying “Huh?” These commercials aren’t just surreal and avant-garde: they don’t have a call to action. A call to action is what lets your customer know what they should do next. Without a call to action, your audience is going to think about your commercial for a few minutes, and then forget it forever. Some businesses don’t need a call to action. These are large corporations: McDonald’s, Pepsi, and Wal-Mart. For these companies, an ad just serves to remind people that they exist. Though this works for these large corporations (since they already have maxed out their brand awareness and identity), it does not work for small businesses and local companies. For small businesses, it’s essential that there be a very clear call to action. Even large businesses can make this mistake. In the 2018 Superbowl, Stella Artois delivered a confusing ad that integrated a charity appeal with their own advertising — and included a celebrity spokesman. The audience was left wondering exactly what they were supposed to do… and why. Commercials are kept short for a reason — and it’s not just because of cost. Most people can’t concentrate on an ad for longer than a couple of minutes. After all, you’re asking your audience for their time to sell your product. If you overstay your welcome, it’s only going to lead to resentment. On the Internet, a video can be as long as you want. You can upload a two hour long commercial if you really want to. But you shouldn’t. Though video platforms do give you the freedom to experiment with length, it’s important that you make your videos as concise as possible. You also need to pack your commercial with the most important information upfront: you don’t want to wait until the very end to post your company’s address. Presently, 30-second commercials are often the most recommended. As you can see, quite a lot of the issues that people have in video marketing deal with misunderstanding their audience and their demographics. You need to understand your audience if you’re going to be able to reach out to them — and avoid potentially offending them or aliening them. At the same time, it’s also important to note that many of these mistakes have been made by large, multi-national or global companies. With all of their resources, marketing research, and experience, they still couldn’t entirely avoid video marketing mistakes. Everyone will make mistakes from time to time — and most of them can be recovered from. You just need to pay attention to what your customers are saying.